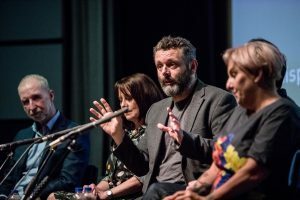 Michael Sheen paid a visit to Chapter yesterday (Saturday 8 July) to host a Q&A session following the screening of Dispossession: The Great Social Housing Swindle, the opening event of the art centre’s documentary film strand Real to Reel. Dispossession: The Great Social Housing Swindle is a feature length documentary exploring the failures and deception behind the social housing crisis in Britain. Directed by Paul Sng, maker of the acclaimed cinema release Sleaford Mods – Invisible Britain (2015) this film tells the stories of individuals and families who have been uprooted from their homes and communities and looks at the alternatives to estate demolition and ‘regeneration’. 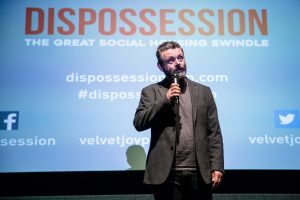 Dispossession: The Great Social Housing Swindle opened the latest season of Real to Reel, Chapter’s documentary film strand, and is likely to be screened again at Chapter in the near future due to its popularity with audiences. Upcoming films in the Real to Reel series include: Summer in the Forest (PG), (12-13 July) which follows the L’Arche commune that was set up by Jean Vanier as an alternative to the violent asylums that existed in housing people with learning disabilities; Queerama (15) (19 July), in which the music of John Grant and Goldfrapp takes us on a journey through the British Film Institute’s archive of gay film discovering the relationships, desires and fears of the LGBTQ community in the 20th century; Risk (Cert tbc) (21-27 July), a 2017 German made documentary following Julian Assange over six years; and many more.